Three of the five council members were at city hall Monday evening to discuss the replacement of damaged sidewalks and choosing a new auditor for the city. After 133 letters were sent out to property owners who would be affected by the street and sidewalk construction areas, only four people showed up to the impromptu town hall meeting last month, said Council Member Andrew Schrauben. What first started as an internal discussion on developing a sidewalk replacement program in August of 2011, has now developed into a schedule to break ground nearly two years later. The city also approved a new audit proposal from Vredeveld Haefner LLC for a new three-year extension for Lowell Light and Power worth $7,500 a year. Vredeveld Haefner LLC will also begin to audit the city as well, now putting one auditor in charge of Light and Power and the city. Doing so will cost the city $11,500 every year for the next three years. The proposal was passed by city council by all present council members which included Schrauben, James hall and Mayor James Hodges. The company that is taking on the city’s responsibilities was established to provide service and expertise to governmental and nonprofit entities having already worked with Ottawa County and cities that include Cedar Rapids, East Grand Rapids, Ionia, Mount Pleasant, Rockford, South Haven and Walker. The fees are expected to end on June 30 every fiscal year. City Manager Mark Howe was excused from attending the meeting because he was on vacation. However, Getzen was on hand to fill in. Council Members Chris Schwab and Sharon Ellison were not present, and were excused. Howe, along with the other absent council members, will be back for the next scheduled meeting on July 15, at city hall. A pre-construction meeting was held for the Riverwalk extension project and is now scheduled to begin construction on July 15. On a further note, all city of Lowell offices will be closed this Thursday for the Fourth of July holiday. The man who can be seen walking the fairgrounds has been involved with the Kent County Youth Fair for more than a decade in nearly every form imaginable. Bruce Doll first joined the youth fair in 2000, shortly after he and his family moved from Kentwood. Doll became involved in Cub Scouts, but felt a drawn toward the fair. Now Doll is the vice president of the fair where he books the entertainment, special programs, sponsorships and helps deal with the technological aspect of the fair. Since Doll has been involved, the fair has received four times the amount of sponsorship money in the past four years. But to this day the most difficult part of his job is that he can’t be there all the time. Doll works in Hudsonville and can usually be spotted at the fairgrounds in his spare time and after work when he stops in to see if anything needs to be done. In the past decade, the man has held about every position except treasurer because “that would be a mistake.” Those positions have included vice president, president, secretary and as a board member. Over the years, the one thing that struck a chord with Doll was the tractor structure dedicated to Ron Wenger, the fair manager who died two years ago. Doll can never run out of good things to talk about when it comes to Wenger. To pile onto his job and responsibilities at the fair, Doll’s wife passed away six weeks ago. Now he is dealing with the loss of his wife of 34 years, with the help of his sons Justin and Tom. A year ago, while the fair was in full swing, she fell ill and was out into the hospital. As a result, Doll was here and then there with not much sleep in between. The disease that took his wife has no known cause or cure, prompting doctors to treat it with steroids. She fought it for a year. Yet the most difficult thing Doll has had to deal with in regards to the fair was freeing up more of his time to volunteer when the flood hit Lowell. The town had it pretty bad, but the fairgrounds was another story. Doll and a handful of volunteers scrambled to get all the boats out of the barns and were forced to watch as the water level constantly rose. Despite all the obstacles, Doll remains adamant on increasing the success of the fair, while keeping an eye on the future. “I think Lowell is a great place to live and it’s got great people. That’s why the events in Lowell are so great,” Doll said. 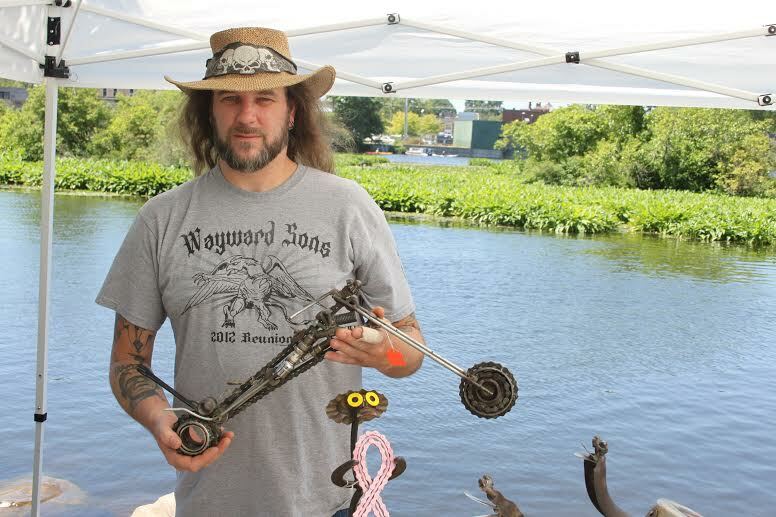 LOWELL, Mich. — Among the numerous booths on hand at the Riverwalk Festival in July, was one that sold sculptures made entirely of recycled metal. Made from automotive parts and silverware, Rob Rose takes old metal and turns it into art. The result garners metal motorcycles, birds, planes, scorpions, spiders, and flowers, leaving the benefactor and opportunity every weekend at art shows. Like the doctor who created the famous monster, Franky has a knack for combining bits of pieces to make art. Born and raised in Lowell, Franky graduated from Lowell High School and proceeded to marry his high school sweetheart, while settling in Saranac. The couple wanted to remain close to their Lowell roots without moving to a big city. Three years ago Franky was laid off from a factory job and went back to school for welding. However, he soon realized he could not find a job welding in the area. Instead, Franky was stuck with an abundance of metal, which he kept in both the house and garage. While pondering what to do next, he received a picture from a friend of an old recycled bike, made from small pieces of metal. This jump started the beginning stages of Franky’s new hobby. In the spare time he had, Franky began to construct the very statues and sculptures that now decorate several lawns and houses to this day. Franky still remembers the first gallery he went to. To him it seemed weird, and based on what he wore, the welder from Lowell stuck out like a sore thumb. Franky, who is known among his friends to dislike the city and being around one entirely, walked up to the hotel with a straw hat, long hair and beard accompanied with tattered jeans. Other artists that night wore black tie suits and the usual full dress one would see on the red carpet. Inside the ballroom was another story. After passing the doorman/security guard, Franky came to realize that he wasn’t walking into a glorified flea market, but a showcased art gallery. Luckily, the lady who was running the gallery spotted Franky right away and showed him where to set up. By the end of the night he was a hit, and had sold the most out of every other artist in attendance. Later that night he ran out of business cards to handout and has since been contacted by art galleries for his coveted recycled art. However, When asking Franky about his art, he’s quick to remain humble. A lot of his friends are mechanics, leaving him with spare car parts that would otherwise be thrown away. Franky also visits bike shops in Ada and Ionia that have spare chains and other parts that are normally hard to get rid of. The sprockets and chains prove to be useful for the craftsman. most of the material Franky comes up with are free, with a few items being purchased at salvage yards and garage sales. The price Franky chooses stems from how much time he puts into the piece, ranging from several hours to several days. His friends tell him his prices are too low compared to what has been seen on eBay. These same friends tell him he should consider branching out. With the future in mind, there are only two things Franky continues to think about. The farmer’s market that Lowell is so accustomed to seeing in the spring has made several changes to its operation. Liz Baker, the director of the Chamber of Commerce, who has helped jump start the weekly event, revealed a few changes to the market this year. By shortening the season, baker meant the market will begin June 13 and run through Sept. 12, cutting nearly two months farmers had to sell portions of their crops. The reason for excluding the eight weeks is due to the amount of competition, with every small town now showcasing markets of their own. The Lowell market started at the fairgrounds and drew success in its first few years, until Ada opened a market on Tuesdays. Market Masters Dave and Betty Dean revealed additional changes, which included the use of the flea market that was only allowed at the farmer’s market once a month. Now it will return regularly every week. The market used to open in May and was held until the second week in October, but now it is expected to end in September, right after school begins in the area. The market will still take place at the Tractor Supply parking lot, where it has been for the last couple of years. Around a dozen vendors are expected this year for the market, which will be held every Thursday afternoon. Closing in on their third year as market masters and their eighth year in participation, the Deans will be allowing the community again to expose local programs which included FROM, the library and the museum last year. Peering out over a dozen acres of the Bedrock Driving Range, Ken Clausen can remember when it held a diverse collection of trees and vegetation. Going back to last March until its opening day, Clausen had been tirelessly working on perfecting the land and lending it all of his available time and energy. The field was nothing but briars and loose brush, which he managed to cut by himself with a handful of John Deere mowers. Hundreds of rocks that he pulled from the knee-high grass now line the outer edge of the driving range and its fertilized green. 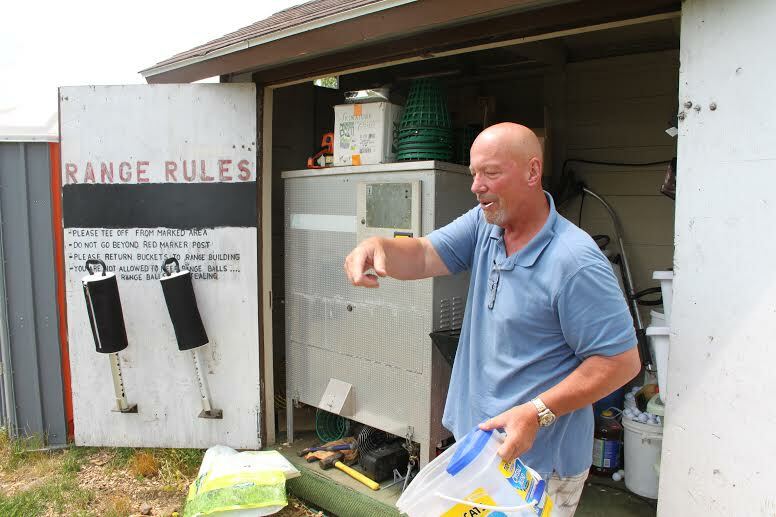 After six months of waiting, Clausen finally opened the driving range only to be forced to close it three days later because of the flood that swept through Lowell and the rest of Kent County. Before this, Clausen was focused on his free windshield chip-repair business, always standing with a sign out by the road offering his services. “Half the time I was so bored I would bring the gold clubs with me and start hitting balls out into the weeds,” Clausen said pointing to where the range now stands. As a retired autoworker, Clausen enjoys being outside and meeting people. Now he is going into a profession he prefers, having played golf since he was 12 years old. PGA member Ken Kapcia, who works at Golf Galaxy and helps the boys and girls golf team in Lowell, has offered to give lessons to customers at Bedrock. However, the hurdles Clausen faced made their way to the township. “When I was setting up my windshield business, I wanted to sit up close to the highway where Woody used to sell golf clubs,” he said. After the township denied him the spot near the highway, Sam Noon, owner of Noon Equipment, offered Clausen a chance to build the driving range. Bedrock has received a lot of people who come out close to dark after dinner, with Clausen now planning to reseed the entire range in the fall and level it out. The Alto Elementary School will see a change in its parking lot this summer, which has been a pain to many parents and drivers in the community. The Alto Downtown Develop Authority is expected to pay for the costs of the new parking lot instead of the school district, because of the problem the old one gives the school’s community. The same thing occurs during school events, making it a nightmare for those who try to navigate down the street. Graham said the DDA is paying for the new lot because it is a problem that has affected the whole community along with the school. The representative for Alto’s DDA mentioned the pesky parking lot is used for other functions as well. 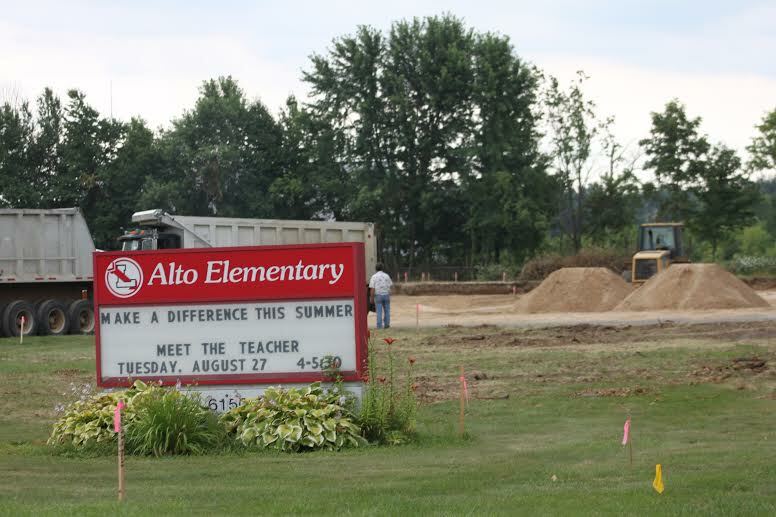 What has been troublesome to both the school and Alto’s community for years will be reconstructed this summer thanks in large part to funding provided by the DDA. Pratt said the school and the DDA have been working together for the last year in preparation for the new parking lot, taking into account the benefits for both parties. Some of the changes will be to add 74 parking spaces for cars and creating a new entrance for those cars, so the parents will have a completely separate entrance from the school buses. The school and the DDA have not gotten their bids back, but are estimating them to be in the range of $120,000. Graham said they are hoping to have construction done by the end of June or early July – well before the next school year begins. The DDA also paid for the quarter-mile track for the school a couple years back worth $75,000, and will likely go the same route when finding a contractor for reconstructing the new parking lot. A body was found in the Grand River on June 8 and is believed to be the Kent County man who has been missing for more than two weeks. The Kent County Sheriff’s Department received a call from friends of Robert Nylen, who had been conducting a search of their own along the banks of the Grand River. According to the media release sent from KCSD, they had found what they believed to be a body caught in a log jam on the Grand River less than a mile downriver from the Ada boat launch. Personnel from the Road and Marine Patrol units responded, along with assistance from the detective assigned to the case. Evidence personnel and Marine Units recovered the body, which was then turned over to the Kent County Medical Examiner for an autopsy. KCSD Capt. Chuck DeWitt confirmed the autopsy’s completion, but noted there was too much damage to the body to properly identify the individual. The body was said to have been down there for an extended period of time, but cannot be determined for how long. As soon as Kent County officials get the results back from the dental records, the information on what the autopsy found will be released. The 62-year-old was last seen walking near Timpson Avenue on Grand River Road in Lowell, wearing blue jeans and a short-sleeved polo shirt with no shoes. The first day Nylen was found missing in Ada, he was spotted at the corner of Bolt and Buttrick. Nylen was said to have been known to take walks every day, and has been missing since Saturday, May 25. Lowell Police Chief Barry Getzen said the Robert Nylen case is being investigated by the Kent County Sheriff Department. The sheriff department has asked local authorities to assist them from time to time to check on any tips within the city of Lowell. Last week, KCSD Undersheriff Jon Hess said dogs on the search team had found evidence by Grand River that indicated Nylen might have been there.